As you enter our sanctuary on Sundays or on other occasions, you certainly notice the brightly colored quilt that decorates the right wall. You may also have noted the date in the lower right-hand corner, 1885. 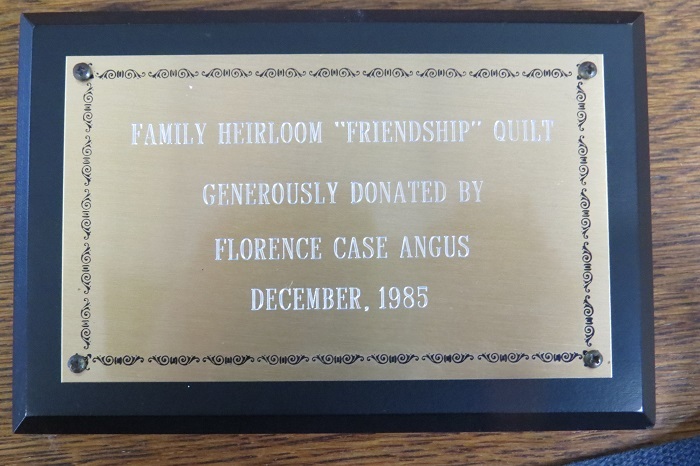 A plaque to the right of the quilt identifies the quilt as a gift from Mrs. Florence Case Angus and that it was donated in December 1985, the month that marked the opening of our present Heritage Church building. An article written by Debbie Wiatt for the Hyde Park Living magazine dated November 1985 tells more of the story of Mrs. Angus and her gift to us. “They just don’t make things the way they used to… and if you want proof, just talk to Florence Angus. Covering a table in the living room of her Hyde Park home is an exquisite quilt that was made in 1885—100 years ago— and it is still in mint condition! “One first notices the intricate detail and brilliant colors. The entire quilt is made from pieces of silk and velvet of varying shapes and sizes, carefully bound together with stitching so perfect that the backing is almost as attractive as the front. Each piece is either needlepointed or hand-painted with a unique design that obviously had some special meaning. 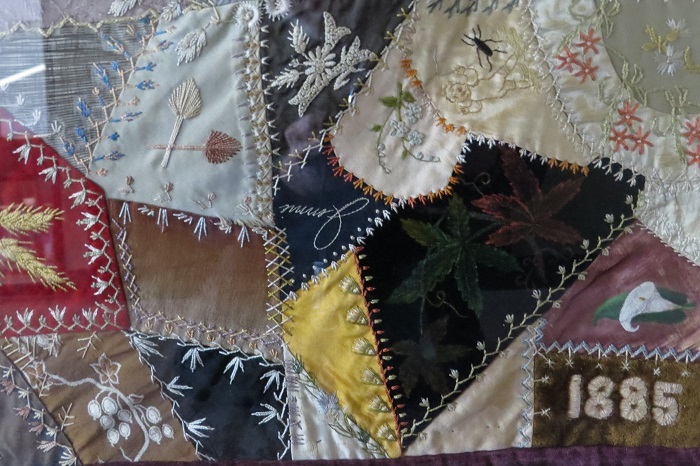 For instance, there are two women’s names, a pair of scissors, several hand-held fans, various animals, and other interesting designs lovingly attached and painted into the quilt. Mrs. Ichabod Blakeslee (Louisa) unfortunately passed away just two years after completing the quilt. Her granddaughter, Claudia Berdan, reached adulthood and became a school teacher in Chatfield. She married Charles Seymour and they eventually moved to Great Falls, Montana. At age 64, Claudia was widowed and was working in Great Falls as a dressmaker. She died at age 88 in Great Falls in 1964. As to our benefactor, Mrs. Florence Case Angus passed away on March 9, 1998 at the age of 97. It states in her obituary from the Cincinnati Enquirer that she worked as a medical technologist at Children’s Hospital and was a member of the group that developed the Sabin oral polio vaccine. 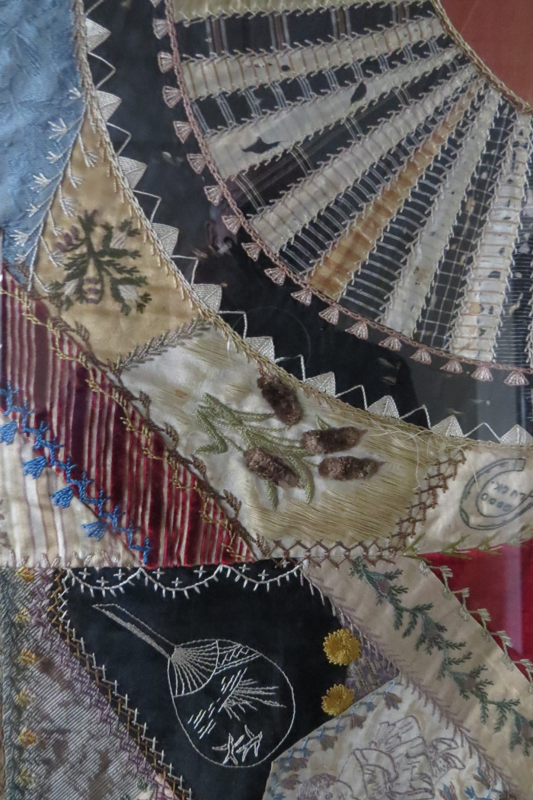 These closeup pictures of the quilt help to reveal the intricacies of the designs. 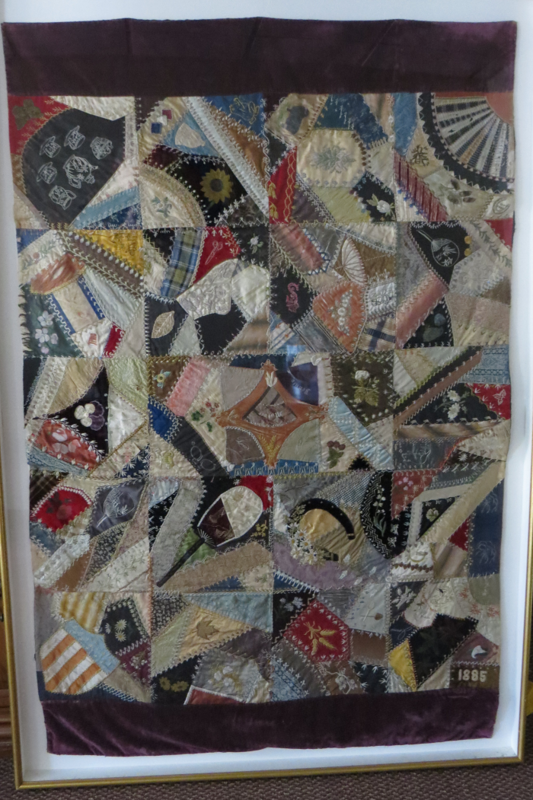 Take the opportunity to examine the quilt swatch by swatch to see the detail of this marvelous example of homemade art. 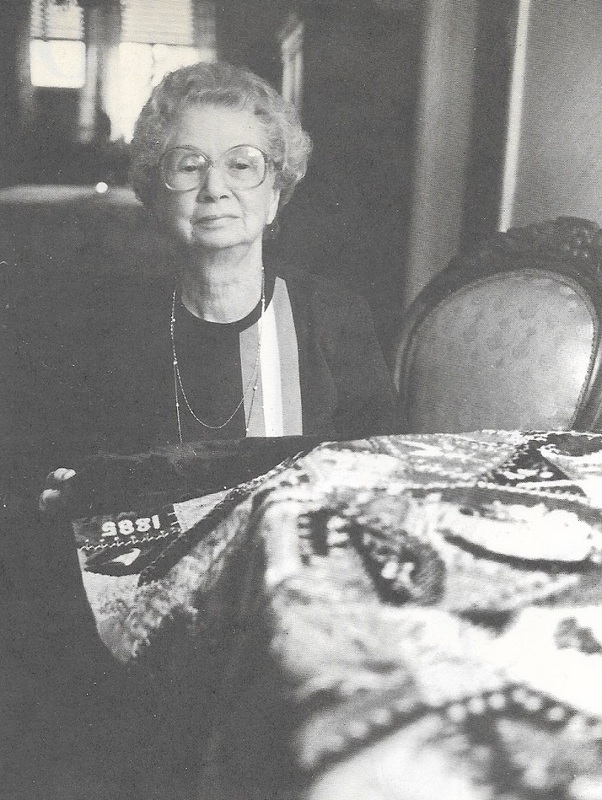 The picture below of Florence Angus holding the quilt appeared in the November 1985 issue of Hyde Park Living. Our thanks go to the publisher (www.livingmagazines.com) for permission to use the photograph. Article “The Quilt” date: February 2019.